A website ranked various idols by their handsome look and published the top 30 of the ranking. Have a look if your favorite idol is in the top 30! A recent list based on results from a poll on “idols most wanted as boyfriends” has been published. Taking first place is BEAST’s leader and rapper Doojoon with 2931 votes. SHINee members Onew and Jonghyun have a strong showing at second and third place, respectively. Fellow group members Taemin (12th), Key (16th) and Minho (17th) also place relatively high on the list. [NEWS] Which Idol Had the Sexiest Beard? Forbes Korea ranked the top 40 celebrities in Korea. They first gathered a list of the most-searched celebrities from portal sites, then trimmed the list by keeping the top 100 that had appeared on many variety shows, dramas, movies or was active in sports. Then they examined how much each celebrity earned with one filming of a CF or a drama episode. Then an examination of how frequently they appeared on music videos and on the first page of various magazines and took over one whole page of a printed newspaper. The number of appearances on variety shows were taken into consideration, as well as the rankings on Hanteo chart for singers. MCs were checked for how many shows they MCed and how frequently the shows aired, and drama and movie actors were checked for the popularity of the work and how much they were paid for it. [INFO] Super Junior In Music Bank Special This Week! Bugs recently released their list of the Top 100 songs for 2010. The ranking is based on the data on streaming and downloads gathered by Bugs Music from November 5, 2009 – November 3, 2010. Mnet have done another poll, and it looks like this time, it’s for the ‘The Top 30 Best Looking Idols’. The first place has gone to none other then fresh-faced beauty Kim HyunJoong, while second place went to 2PM’s Nichkhun. Check out the rest below. 20 local idols (Girls’ Generations, SHINee, 2PM, Kara, Beast, etc) is part of the ‘Group of 20’ who are participating in the G20’s campaign song, Let’s Go! The representative from Seoul, Choi Jin, said that, in order to have a successful meeting, citizens should be more involved in the G20 Summit being held in Seoul, and thus, the G20 Campaign song, Let’s Go. Productions for ‘Let’s Go’ will be done by the 12th of October. ‘Let’s Go’, composed and written by Sinsa-Dong’s Ho Raengil (real name Lee Ho Yang) , Im Sang Hyuk, Eddie (Eddie), Yong Junhyung, these 4 are the people in charge of the song, The song includes 20 artists, from Girls’ Generation, SHINee, 2PM, 2AM, Son Dam Bi, Beast, After School and Super Junior. 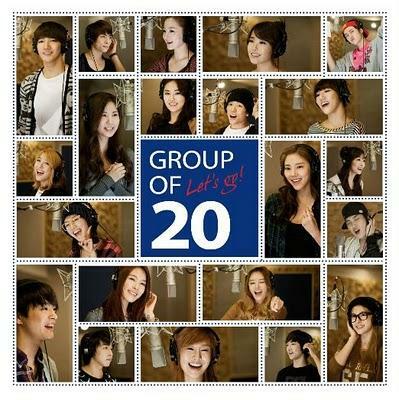 Because the song is for the G20, the album name and the number of artists selected to participate was named ‘Group of 20’. In a Chinese Newspaper, The Top 20 Smiling-eye Male Idols in Kpop was revealed. Girls’ Generation, Super Junior, will be among 20 of the singers that will be the voices of the ‘G20 Summit’.